Barca pulled another Anoeta turnaround as two goals in three minutes saw them come away with a 2-1 win in the historically tough ground. 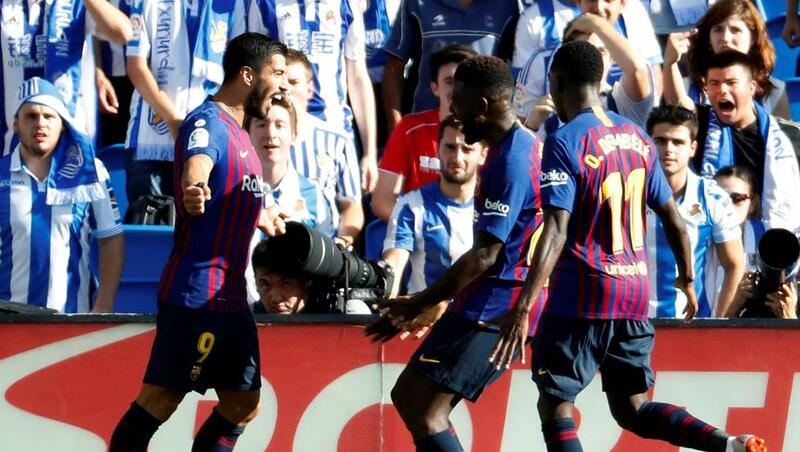 Barca fell behind to an early Aritz Elustondo volley, but a quick-fire brace from Luis Suarez and Ousmane Dembele in the second half kept the champions top of La Liga with maximum points. Rafinha formed part of a refreshed Barca midfield, which also included Sergi Roberto as Nelson Semedo came in at right-back. Elsewhere, the Blaugrana's Holy Trinity of Gerard Pique, Jordi Alba and Lionel Messi rested during the international break and were included in the XI. However, Malcom was still sidelined with an ankle injury, Philippe Coutinho was only a substitute and Arthur was left out completely, the latter cases presumably on the grounds of fatigue. La Real, meanwhile, picked up four points from their opening three games, but Saturday's clash with the Catalans was their first at the newly-renovated Anoeta. With the stadium's running track removed, Txuriurdin fans were closer than ever to the action - and Imanol Agirretxe after the freshly-retired striker went out to a standing ovation before kick-off. Last season's 4-2 win in San Sebastian was Barca's first in the League for 10 years, but their demons came back to haunt them when Aritz half-volleyed past Marc-Andre ter Stegen from a corner. VAR denied the visitors a couple of penalties before half-time, prompting Ernesto Valverde to throw on Coutinho for the second period. That didn't stop the home side from threatening on the counterattack, yet Mikel Oyarzabal could only blaze his shot over and Theo Hernandez fired straight at Marc-Andre ter Stegen, who also somehow kept out Juanmi's close-range finish with his legs. La Real would pay dearly for their profligacy, starting with Luis Suarez stabbing home from a goal-mouth scramble, before Geronimo Rulli flapped at a corner, gifting Dembele the rebound, which deflected past the Argentine. Valverde was happy to shut up shop, bringing on Arturo Vidal for another cameo, but it almost backfired on the League leaders as Juanmi could only glance a free header wide from Mikel Merino's spectacularly-clipped through ball. anyone catch the discussion between valverde and pique in the last 3 or so minutes? I believe it's only our 3rd comeback in San Sebastian in the history of the club. If my commentators are to be believed. I've seen this movie before. Us playing crap and grinding wins until luck runs out and we're exposed in CL by an inspired opponent playing their hearts out. Truth be told, I'd be happy with another double, but I don't think it's gonna be that easy this season. Refuse to lose! Barca is not a good team at the Anoeta. It's a tribute to the manager and the players that they can beat a good team away on a day when they are not sharp. All times are GMT +1. The time now is 06:27 PM.